Mockup design of iPhone 5. Last time, I was so impressed with iPhone 3GS design. Very beautiful and elegant. When iPhone 4 came out, I was not so impressed with the design. It looked bulky and hard. After a while, I seem to like iPhone 4 design a bit more than iPhone 3GS. It looked neat. Now, the design iPhone 5 might go back to the design iPhone 3GS. According to a Chinese source, Apple will replace the current glass design with aluminium casing due to problem with scratches on the glass surfaces, difficulties with white paint and the weight of the glass just like the first iPhone’s aluminium back casing. 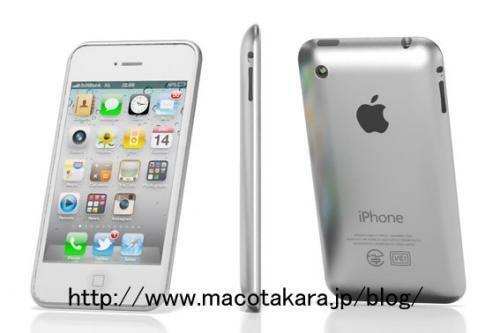 With the revamp of the material used for the casing, the antenna of iPhone will also be redesigned to prevent the Antennagate issue that’s plauging AT&T iPhone 4 & Verizon iPhone 4.
iPhone 5 is expected to have Apple A5 dual core processor and will likely be released in June/July in United States (US). When will iPhone 5 comes to Malaysia? How much will iPhone 5 be in Malaysia? 3 Reasons That I should Not Buy iPhone 4 & Wait for iPhone 5!!! White iPhone 4 is finally here in Malaysia!!! Next story Live Blogging for my 1st time: YES 4G the Great Penang Food Hunt! Previous story iOS 4.3 launching on March 10, 2011?